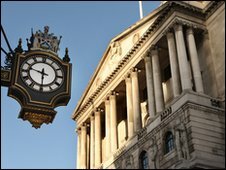 The Bank of England has decided against further quantitative easing (QE), the policy designed to stimulate growth in the UK economy. Under QE, the Bank has pumped new money into the economy by buying assets such as government bonds, as a way to boost lending by commercial banks. Last week, it revealed it had spent all of the £200bn it created for QE. The Bank also kept interest rates on hold at a record low 0.5% for the 11th consecutive month. While halting QE, the Bank said the £200bn already injected into the economy through the programme would "continue to impart a substantial monetary stimulus to the economy for some time to come". But it did not close the door on further spending. "[The Bank] will continue to monitor the appropriate scale of the asset purchase programme and further purchases would be made should the outlook warrant them." One area that it will be looking at is banks' lending to businesses and consumers, as QE was designed to help boost lending. "Conditions for lending in this country, especially to small and medium-sized businesses, are still much weaker than [the bank] would have wanted," said the BBC's economics editor Stephanie Flanders. What now for mortgage and savings rates? Analysts said concerns about rising inflation were one factor in the Bank's decision to suspend QE. "Inflation is considerably stronger than the Bank had expected and there are concerns that it won't get back within target [if QE continued]," Jason Simpson from Royal Bank of Scotland told the BBC. Official figures in January showed that UK consumer prices rose in December by 2.9%, their fastest annual pace for nine months and above the Bank's 2% target. Bank Governor Mervyn King warned last month inflation was "likely to rise to over 3% for a while", and could go even higher if energy prices and indirect taxes were to increase further, but added that it "should return to target in the medium term". Although the UK did officially come out of recession in the fourth quarter of 2009 - ending six consecutive quarters of economic decline - the growth was just 0.1%, much less than expected. For that reason, most analysts expect rates to stay at 0.5% until at least the second half of 2010 for fear of the UK falling back into recession. First, with the permission of the Treasury, the Bank of England creates lots of money. It does this by just crediting its own bank account. The Bank of England wants to use that cash to increase spending and boost the economy so it spends it, mainly on buying government bonds from financial firms such as banks, insurance companies and pension funds. The Bank buying bonds makes them more expensive, so they are a less attractive investment. That means companies that have sold bonds may use the proceeds to invest in other companies or lend to individuals. If banks, pension funds and insurance companies are more enthusiastic about lending to companies and individuals, the interest rates they charge should fall, so more money is spent and the economy is boosted. Theoretically, when the economy has recovered, the Bank of England sells the bonds it has bought and destroys the cash it receives. That means in the long term there has been no extra cash created. Business basics: What is GDP?